We can supply a range of high jump equipment for recreational and professional use at many facilities in the UK. This could include things like landing mats, crossbars and measuring sticks in a range of shapes and sizes to suit schools or clubs. Depending on the level of use, there are different products that we can supply to offer the best performance and most cost effective price for you. We’d be happy to answer any questions or provide more details on what we can offer you. Just fill in the contact form and let us know what you’re looking for so one of our experts can get back to you. Please try to include as much information as possible about your facility, and we’ll be able to give you the most appropriate equipment. In order to make the most of an athletics facility, it’s important to have all the best high jump equipment for training and competitions. 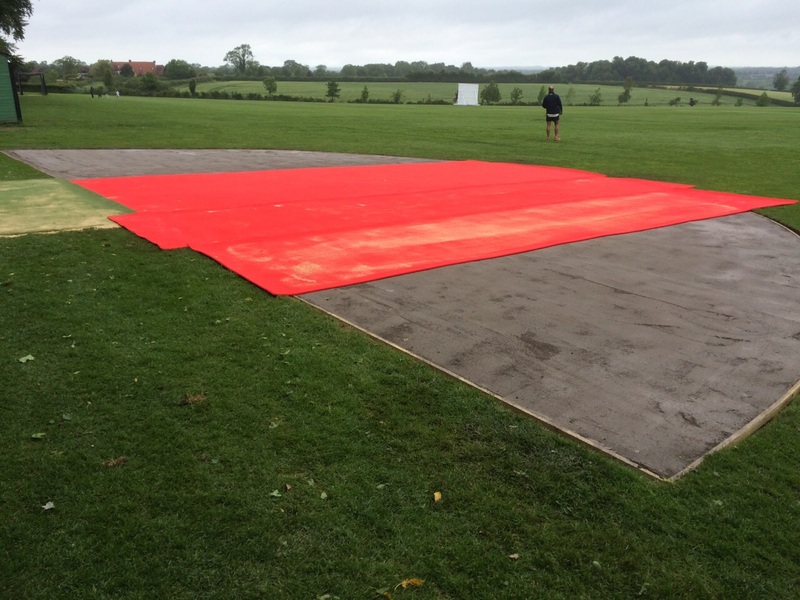 The different accessories that we supply are used to add both safety and performance characteristics to athletics areas at UK clubs, universities, schools and colleges. You can choose from a selection of designs to meet your budget and the standards your facility requires. As a professional contractor we also carry out the full construction run up tracks and practise spaces so please click here to find out more on this. For competitive events and athletics training, you will need to accurately measure the height of a jump that each athlete does. This is done with specialist measuring stands and we can supply these outdoor high jump products for your facility. These stands are positioned at either side of the jumping area and can come in a range of heights depending on the level of ability for those using the facility. We can offer school recreational sized stands up to IAAF governing body international level ones with a range of prices, each of which is fully adjustable for simple versatility. Every high jumping facility needs a crossbar or lath, this is what the athlete jumps over and has to avoid knocking down. We offer two types of crossbars for different uses in either recreational school activities or professional competitions. Flexible laths are most commonly used as high jump equipment at school facilities, these are made of foam with an elastic cord running through it which children and beginners can use to practise safely. Fibreglass crossbars are typically used for more professional and competitive athletes up to IAAF standards. This type of facility will typically be installed with a polymeric rubber surface specification for optimum performance qualities. We often supply these for athletics clubs who are holding competitions at a professional standard and need the highest specification of equipment. The costs for each of these pieces of equipment will of course be different and we can offer further advice on the prices if you fill in our contact form today! Safety should always be the main priority for any sports area at school, university or club. 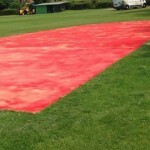 We supply high jump landing mats which allow athletes to land their jumps safely without risk of injury from falling. 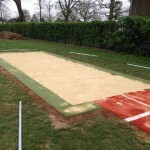 Depending on how your athletics facility is used we supply specialist safety matting to suit a range of high jump dimensions, starting from junior school and going up to international competition levels. You can also use the mats for other track and field events, gymnastics and general PE activities as they are extremely versatile. 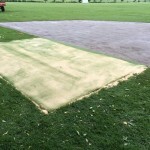 These landing mats are made from foam with durable PVC covers to resist damage and ensure comfortable impact absorption during use. Each of these landing mattresses comes with a reversible spike resistant wearsheet as well. 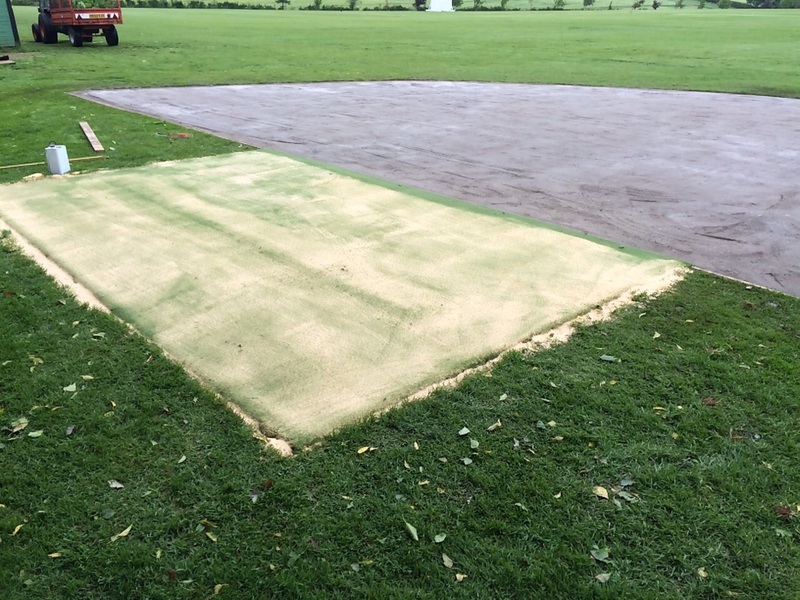 If you have an outdoor facility, we recommend that you also have a base or platform for your landing mat which will prevent the foam from getting dirty and water damaged. Various athletics clubs as well as colleges have begun to get more affordable facilities constructed for athletics. Numerous schools and colleges find it difficult to get sport areas renovated, which means children lose out on athletics chances. The reason behind this could sometimes be as a result of limited space outside or a lack of funds available for the school. Compact sporting facilities are created to fit existing areas and budgets, and also provide practical, motivating features that individuals of all ages as well as every ability could better their physical fitness as well as self confidence. By using these, children are qualified to better running, jumping as well as throwing skills which are part of the FUNdamental phases of development. In the video above you can see our team laying one of these facilities at a school, using a needlepunch synthetic turf carpet. This is a popular design for recreational tracks because it is soft enough for children to use, and it’s durable enough for everyday use. Young people are going to be introduced to a number of activities using high jump equipment and other apparatus, making an effort to raise the number of kids taking part in compact athletics. Jogging circuits, jumping runways and discus circles are just some of the favoured activities that could be put in. 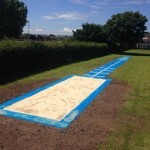 Multiple activity facilities can be produced by installing a single track; this can be utilised for long jump, relay races, hurdles and many others. In primary and secondary schools that can’t get a full-sized track, this makes a fantastic alternative that’s more cost effective as well as uses up a lot less space. One good reason why having a multi sports area constructed is advantageous for the kids is simply because it allows them to take part in different events and find one that they enjoy, that may direct them to even more opportunities later on. One issue which is impacting young people’s engagement in sports and athletics is a shortage of facilities which are targeted at beginners and beginners level sports athletes. Athletics activities really should be introduced to children from key stage 1, key stage 2 and also build up skills onto key stage three and key stage four. A fresh set of guidelines has been made by UKA to assure sports and athletics areas are more widely available to young people. This offers a cost efficient, versatile, beginners level option that utilises attractive designs and colour schemes created to appeal to new participants. For organisations with limited budget and space, the compact sports and athletics facilities make a ideal option for training basic FUNdamental skills within a variety of sports activities. These often include features such as triple jump runways, small sized high jumping fans and also perimeter jogging tracks. When there’s limited space, we can decrease the size and design of specific athletics facilities, as well as compromising on any high jump equipment. The flexibility of the style of compact athletics facilities means that they are relevant to a wide range of situations. Colleges, universities, primary schools and also high schools are able to set up these to complement existing sports activity and play provision. By participating in distinct sports and athletics activities, kids from Key Stage One – Key Stage Four all can improve learning and also physical fitness abilities. Far more kids may be inspired to participate in the brand new sporting events if they have a high quality and appealing facility available for them to use. For almost any institution attempting to reduce costs and stick within a budget, the small sized recreational facilities provide an excellent solution. Smaller sized features help present the FUNdamentals of sports and athletics therefore children can develop simple skills of motion along with physical activity. 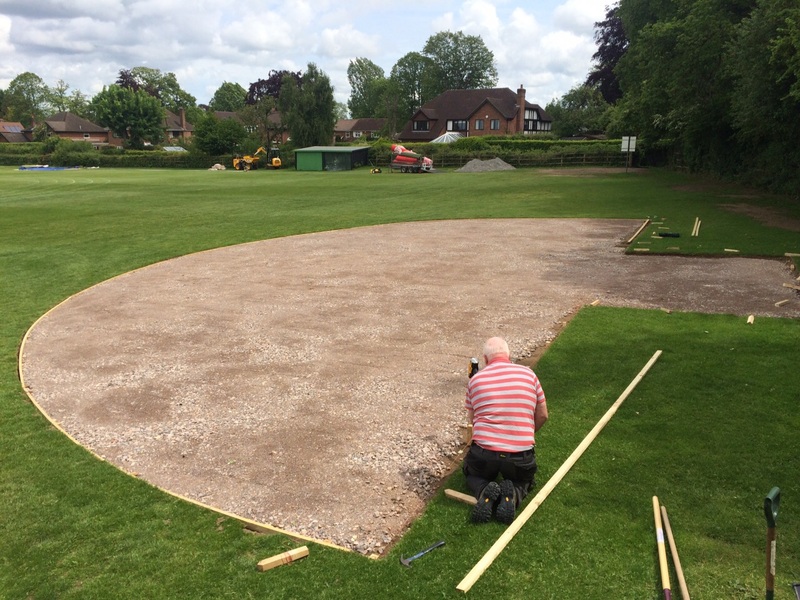 We can install a range of athletics track surfacing in different sizes and specifications to suit many budgets. The introduction of a broad network of compact athletics facilities is a major factor of UKA’s desire to get the interest and need in the sports activity. Considering the IAAF and IPC World Championships are being hosted in London in 2017, it’s likely more and more children will begin to get involved. By enabling young people to use the compact facilities, there’s a greater chance for athletes to better their skills and move into professional athletics clubs as a result. 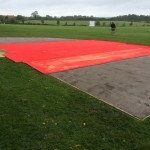 If you are unsure of the best type of landing mats or specialist athletics equipment to choose, please don’t hesitate to ask us for advice. 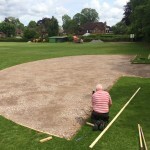 We are specialist contractors and equipment suppliers and have worked with numerous organisations to install sports facilities throughout the UK. Use the enquiry form on this page to send us over your details and we’ll provide you with more information on the costs and designs for high jump equipment we offer. There are plenty of options to choose from and we’ll be sure to find the right products for you.